After tapping of steel from a primary steelmaking furnace such as BOF, EAF or EOF, molten steel for high quality or specialty applications is subjected to further refining in a number of alternative processes collectively known as ladle metallurgy. Ladle metallurgy is sometimes also called ladle refining or secondary steelmaking. Ladle metallurgy processes are commonly performed in ladles. Tight control of ladle metallurgy is associated with producing high grades of steel in which the tolerances in chemistry and consistency are narrow. The objectives of ladle metallurgy are the following. Ferro alloys and carbon additions – Making adjustments in the chemistry of liquid steel. Decarburization – Removal of carbon for meeting the requirement of certain grades of steel. Depending on the types of steel required, one or more of the following ladle metallurgy processes are used. These are (i) rinsing or stirring, (ii) ladle furnace, (iii) ladle injection (iv) ladle refining, (v) degassing processes, (vi) AOD process, and (vii) CAS-OB (Composition adjustment by sealed argon bubbling with oxygen blowing) process. 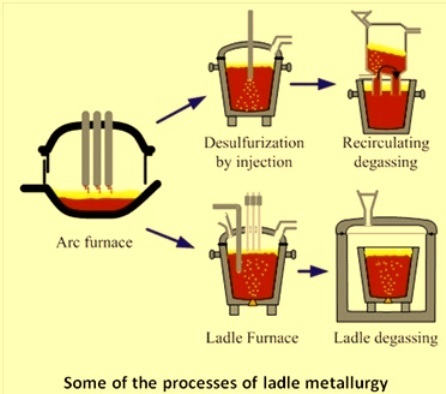 Some of the ladle metallurgy processes are shown in Fig 1. The treatment of steel in the ladle started around 45 years ago when the first ladle-to-ladle and ladle-to-ingot mold vacuum degassing processes for hydrogen removal appeared on the scene. In the late 1950s more efficient vacuum degassers such as the Dortmund Hoerder (DH) and Ruhrstahl-Heraeus (RH) processes became popular. In the middle 1960s degassing processes such as vacuum arc degassing (VAD), the ASEA-SKF process, and the vacuum oxygen decarburization (VOD) process for treating high chromium steels were successfully implemented. Converter processes such as argon oxygen decarburization (AOD) process were introduced in early 1970s. Granulated flux injection into the liquid steel, combined with argon stirring, started in the early 1970s. This was soon followed by the application of cored-wire feeding of alloying elements for better control of composition and inclusion morphology. Today most of the ladles are equipped with bottom plugs for argon bubbling. However provision of rinsing through a top lance mechanism is usually made for taking care of the rinsing requirement as a back up when bottom plug is not working due to any reason. A ladle furnace is used to relieve the primary process of steel making of many of the secondary refining operations. The main functions of a ladle furnace are as follows. Reheating of liquid steel by electric power which is conducted by graphite electrodes. Homogenization of steel temperature and chemistry through inert gas rinsing. Formation of slag layer that protects refractory from arc damage, concentrates and transfer heat to the liquid steel, trap inclusions and metal oxides, and provides means for desulphurization. Additions of ferro alloys to provide for bulk or trim chemical control. Cored wire addition for trimming and morphology control. Provide a means for deep desulphurization. Provide a mean for dephosphorization. Act as a buffer for downstream equipment and process. The ladle roof is typically water cooled design with a refractory centre or delta section and is configured to coordinate with existing ladles such that the roof covers completely cover the top portion of the ladle when in the operating (i.e. fully lowered) position. Liquid steel can be reheated by oxidizing aluminum and/or silicon by means of oxygen injection through a lance. Reheating of steel in the ladle with submerged oxygen injection is being practiced in some steel plants. In RH-OB process an average thermal efficiency of 20 % – 30 % is being achieved. Also a reheating efficiency of approximately 80 % for the RH-OB operation has been reported. In RH-KTB process oxygen is supplied via a top lance instead of through submerged tuyeres as in the RH-OB. The thermal efficiency for the RH-KTB process appears to be similar to that for submerged oxygen injection into the ladle. A comparison of total oxygen contents measured in the cast steel from oxygen reheated heats and heats that were not reheated has shown no significant differences between the two sets of values. The refining of steel in the ladle is broadly defined here as comprising of the operations such as deoxidation, desulphurization, dephosphorization, controlled additions of alloying elements and inclusion modification. The refining steel in the ladle is usually done by deoxidation of steel with ferro-manganese, ferrosilicon, silico-manganese, and aluminum. The steel is first deoxidized partially with silico manganese, ferromanganese, and/or ferrosilicon followed by a final deoxidation with aluminum. Such a practice has several advantages including minimization of nitrogen pick up, minimization of phosphorus reversion and minimization of aluminum losses during primary steel making. Today use of synthetic slags in the ladle has become an integral part of the ladle metallurgy. The use of synthetic slag consisting of calcium-alumino silicate helps in the dissolution of the deoxidation products which helps in the deoxidation activity. Partially deoxidized steel can also be further deoxidized with calcium silicide (Ca-Si) which is injected in the ladle in the form of cored wire. Killed steels deoxidized with aluminum normally have less than 5 ppm of dissolved oxygen. In certain steel grades, a very low sulphur content is specified e.g. 20 ppm and less. These low sulphur contents can only be achieved by steel desulphurization in the ladle in the presence of a calcium aluminate slag when the steel is fully killed. For the required degree of desulphurization to take place within a practical time span, good mixing of steel and slag is essential. The rate, at which the sulphur can be removed, is strongly recommended by the gas flow rate during rinsing of steel. Another method for achieving very low sulphur content is by the injection of fluxes into the ladle. A typical flux used for desulphurization contains 70 % CaO and 30 % CaF2. Desulphurization achieved through powder injection is around 15 % faster than the desulphurization with a top slag only, combined with the gas rinsing. Desulphurization of steel in the ladle is accompanied by a decrease in the temperature of the steel bath and hence needed reheating. Dephosphorization in ladle is needed when the phosphorus content of input hot metal during primary steel making is high. Removal of phosphorus from the steel in the ladle is achieved by treating the steel with lime based oxidizing slags containing iron oxide. Calcium treatment of liquid steel is normally adopted to modify the morphology of the inclusions. As a result of the treatment with calcium, the alumina and silica inclusions are converted to liquid calcium aluminates or calcium silicates. These liquid inclusions are globular in shape because of sulphur tension effects. This change in inclusion composition and shape is commonly known as inclusion morphology control or modification. Since the boiling point of calcium is 1491 deg C, calcium is a vapour at the steel making temperature. Hence when adding calcium to the liquid steel, special measures are required to be taken to ensure its proper recovery in the steel bath. Calcium or calcium alloys are added to the liquid steel bath at the greatest possible depth so as to make use of the increased pressure from the ferrostatic head to prevent the calcium from evaporating. Further calcium retention frequency decreases with increasing quantity of calcium injected. The quantity of calcium to be injected has to be adjusted in accordance with the degree of cleanliness of the steel and its total oxygen content. Vacuum degassing is an important secondary steel making process. This process was originally used for hydrogen removal from the liquid steel but presently it is also being used for secondary refining and has become increasingly important process of secondary steel making. Pressure dependent reactions are the reason for the treatment of liquid steel in this process. During steelmaking gases like oxygen, hydrogen and nitrogen dissolve in steel. Degassing is employed to remove nitrogen and hydrogen from steel. Initially, vacuum degassing was used primarily for hydrogen removal. However, during the last twenty year or so, there has been an increased use of vacuum degassing for the production of ultra low-carbon (ULC) steels with carbon contents of 30 ppm or less. Degassing can be carried out either by placing ladle containing molten steel under vacuum (non recirculating system) or by recirculation of molten steel in vacuum (recirculating system). Examples of recirculating systems are RH, RH-OB, RH-KTB, and DH etc. processes and examples of non-recirculating systems are ladle or tank degassers, including VAD (vacuum arc degassing) and VOD (vacuum oxygen decarburization), and stream degassers. In ladle degassing, the effectiveness of degassing decreases from top to bottom of the molten steel bath. Bottom layers of steel are very much less affected by vacuum since these layers are under the influence of ferrostatic pressure due to column of liquid steel. Hence bath agitation would help exposing the entire content of molten steel to the vacuum. In both recirculating and non-recirculating systems argon is used as the lifting or stirring gas. In recirculating systems the argon is used as the so-called lifting gas to lower the apparent density of the liquid steel to be lifted up from the ladle into the vacuum vessel. In non-recirculating systems argon is used as the stirring gas to promote the removal of hydrogen and/or nitrogen and to homogenize the bath. There is not much difference between recirculating and non-recirculating systems in terms of the effectiveness with which hydrogen or nitrogen can be removed. If the primary function of the degasser is to remove hydrogen and sometimes nitrogen, the choice of system is determined primarily by the desired match between the steel melting vessel and the caster as well as by considerations in regard to capital and operating costs. One of the purposes to treat steel in an RH or RH-OB (KTB) degasser is to lower the dissolved oxygen content of the steel by means of carbon deoxidation before adding aluminum to kill the steel completely. With such a carbon deoxidation practice there are considerable cost savings as a result of the decreased usage of aluminum. Some nitrogen removal from liquid steel during vacuum degassing is possible, provided the steel is fully killed and has low sulfur content. Argon oxygen decarburization (AOD) is a process primarily used in stainless steel making and other high grade alloys with oxidizable elements such as chromium and aluminum. After initial melting, the metal is then transferred to an AOD vessel where it will be subjected to three steps of refining namely (i) decarburization, (ii) reduction, and (iii) desulphurization. AOD was invented in 1954 by the Lindé division of The Union Carbide Corporation, which became known as Praxair in 1992. The liquid steel is decarburized and refined in the AOD vessel to less than 0.05% carbon. The key feature in the AOD vessel is that oxygen for decarburization is mixed with argon or nitrogen inert gases and injected through submerged tuyeres. This argon dilution minimizes unwanted oxidation of precious elements contained in specialty steels, such as chromium. AOD is widely used for the production of stainless steels and specialty alloys such as silicon steels, tool steels, nickel-base alloys and cobalt-base alloys. The process is popular because it combines higher metallic yields with lower material costs. Other benefits include accuracy in chemistry control down to 0.01 % carbon and lower, rapid desulfurization to less than 0.001 %, and lead removal to less than 0.001 %. The end result is cleaner steel coupled with increased productivity. The CAS-OB process consists of composition adjustment by sealed argon bubbling with oxygen blowing. It was developed by Nippon Steel Corporation. The process allows alloy additions to be made under an inert argon environment. It allows simultaneous addition of Al and O2 gas blown through a top lance. These react to form Al2O3 and generate a considerable amount of heat due to exothermic nature of the reaction. The CAS-OB process, therefore results into chemical heating of the liquid steel. The heating of liquid steel is usually combined with the adjustment of the chemistry of the liquid steel by the addition of ferroalloys and carburizer. During heating, simultaneously with injection of oxygen into the bell continuous feeding of granular aluminum, ferroalloys and carburizer is carried out. The actual rate of heating of the metal is slightly lower than the estimated due to the loss of heat during the time gap between the additions and the time of temperature measurement.